The Scottish Wedding Show, in partnership with David’s Bridal, is back for 2019, and is the perfect event for couples across Scotland who are preparing to walk down the aisle. An unmissable weekend for brides and grooms to be, the premier wedding event will take place at the SEC Glasgow on Saturday 23rd and Sunday 24th February – and we can’t wait! 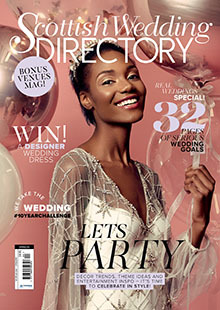 With up to 300 of the UK’s leading wedding suppliers in attendance – including Team SWD – the show has something for every wedding, whether traditional or alternative, vintage or themed. For the third year running, The Scottish Wedding Show is has partnered with David’s Bridal, with the world’s largest bridal retailer on hand all weekend with a selection of stunning gowns and specialist styling advice. Of course, the live Catwalk Fashion Show will also be showcasing the finest in bridal couture. Guests can take their seats at a number of shows over the weekend for a glimpse at the gowns on offer, with bridesmaid dresses, groomswear, mother of the bride outfits and a selection of outfits for flower girls and page boys also taking to the stage. Continue the fun over at the Live Band Showcase which is returning this year with the chance to watch leading performers in action as they search for the perfect music for their big day. Wedding shows are thirsty work so the Cocktail Bar and Brunch area are back again and perfect for some celebratory bubbly to toast your future nuptials. We’ll see you at the show, giving you your free copy of SWD to help with the planning! We’ve got 10 pairs of tickets for Saturday 23rd or Sunday 24th February to give away, plus one lucky winner will scoop a set of VIP tickets for four people for Sunday 24th February, which includes a glass of bubbly and front row seats for the Fashion Catwalk show! All you have to do to enter is visit The Scottish Wedding Show’s website and find the answer to the question below! Entries must be in by Friday 15th February at midnight. Tickets for The Scottish Wedding Show are on sale now, from £13.50 for entry only and £27 for VIP tickets. Want to get in the wedding planning mood before the show? Join SWD, The Scottish Wedding Show and David’s Bridal at the Exclusive Fashion Event at David’s Bridal Braehead on Sunday 3rd February!